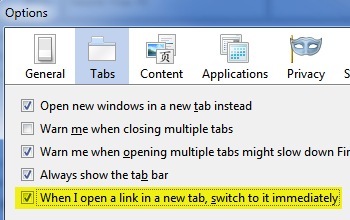 After yesterday's post about tweaking Firefox 3.6 so that it opens new tabs to the far right, just like all previous versions of Firefox, I realized there's one other tip that goes hand-in-hand with that: tweaking Firefox to immediately switch to the newly opened tab. Normally, when you click a link that opens a new tab (or hold down the Ctrl key while clicking a link, which forces a new tab to open), Firefox doesn't actually switch to that tab. It keeps you where you were. That doesn't make a ton of sense. After all, why would you open a new tab if you didn't want to view it right away? Fortunately, there's an easy way to change Firefox's behavior when it comes to new tabs, and you don't even have to meddle with the about:config settings (as with yesterday's tweak). Instead, click the Tools menu, then Options, and then click Tabs. Enable the last option in the list: When I open a link in a new tab, switch to it immediately. (Pretty straightforward, huh?) Click OK and you're done. I'm curious: What's your preferred method for viewing new tabs? The browser's default, or "switch to it immediately"? Leave a comment with your thoughts on this very important matter.